Chillicothe, Mo. ? Faye Copeland, a convicted killer once considered the nation’s oldest woman on death row, has died at a nursing home where she had been released on medical parole, the Missouri Department of Corrections said Tuesday. She was 82. Copeland was convicted and sentenced to death along with her husband for the murders of five transients as part of a late-1980s livestock swindle at their farm near Chillicothe. 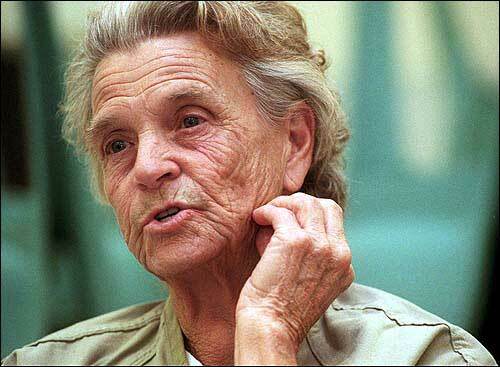 She was the oldest woman on death row until a federal court commuted her sentence in 1999 to life in prison. Copeland suffered a stroke in August 2002 that left her partially paralyzed and unable to speak. She was paroled a couple of weeks later to nursing home in her hometown. Copeland died Sunday at the Morningside Center nursing home from what Livingston County coroner Scott Lindley described Tuesday as natural causes. Authorities contended Ray and Faye Copeland used transients in a scheme to buy cattle with bad checks, then killed the men and buried them in shallow graves. Faye Copeland’s defense during trial was that her husband committed the killings without her knowledge and that she was bystander who was the victim of battered woman syndrome. But jurors found Faye Copeland’s guilty after prosecutors presented a handwritten list of farm helpers in her writing. She had written the names because Ray Copeland was illiterate. Twelve of the names had scrawled X’s by them. Five of those men turned up dead, and prosecutors believed three others who were missing also died. Rep. Kenny Hulshof, R-Mo., who before he was elected to the U.S. House helped prosecute the Copelands in separate trials, said in 1999 that the list of names showed Faye Copeland was more of an accomplice than she claimed. Copeland had pressed for her release since she was imprisoned. Inmate Faye Copeland talks about prison life in this file photograph taken Aug. 19, 1999, at the state prison in Vandalia, Mo. Copeland, a convicted killer once considered the nation's oldest woman on death row, has died at a nursing home where she had been released on medical parole, the Missouri Department of Corrections said Tuesday. She was 82. In 1995, a petition bearing 3,000 signatures was sent to the governor stating that Copeland would not be a threat to society if she was released. Then in 1999, another petition was forwarded, claiming Copeland had no problems in prison and that she was old and needed to be released and brought home. Ray Copeland, who prosecutors say shot the victims, died in 1993 at age 78 at the Potosi Correctional Center while awaiting execution.